Includes All Meals, Drinks, Ground Transfers, Permits, & Mentawai Daily Usage Taxes. Excludes Airfare to Padang, Indonesia & Travel Insurance. 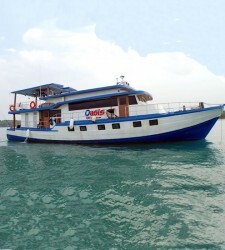 Jump on board Oasis for an adventure to the outer islands of West Sumatra. Get sick waves, paddle in the warm blue sea, catch and eat some great fish. And just kick back as we surf our way around the Mentawai Islands for 10 days / 11 nights. All meals, drinks and transport services included. 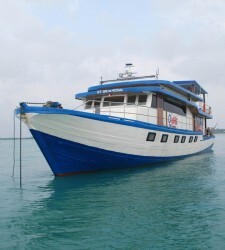 Oasis is a comfortable, well equipped motor vessel, designed for surf charters. Running at 8 to 11 knots with dual 320 hp diesel engines. 24 hour power generators for AC, refrigerators & audio / video needs. Equipped with GPS, Radar, deep finder, & Marine Radios SSB / HF. Equipped with all safety gear including EPREP, Flares & Life Rafts. Comfortable layout with a separate dining room, galley, salon and huge roof deck. Audio/Video includes TV in Salon with DVD Movies, 2 Stereos with one in Salon and Roof Deck. 2 full bathrooms with showers, an additional outside shower for post surf rise off. Oasis hauls two tenders a 17 foot aluminum run-about and 9 foot rubber ducky. Airport Pick-up and Return from Minangkabau International Airport in Padang, West Sumatra Indonesia. All Meals on board Oasis - 3 warm healthy professional prepared meals per day. Plenty of between meal snacks as you need to keep energized and surfing. All Drinks to stay hydrated - choice of soft drinks, juices, coffee, tea and water. 3 beers per guest per day, to kick back and relax after dinner. 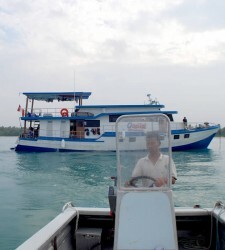 Crew of 5 with Local Indonesian Captain, First Mate, Engineer, Professional Cook & Decky to take care of you. Ground Staff to carry all your bags and manage transport. Concierge to handle airline ticketing or pre/post trip hotels if needed. Trip was awesome. Scored good waves, some days were epic. 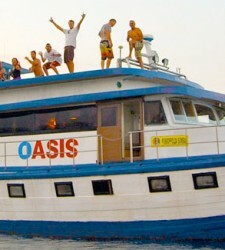 Guys on boat were cool.Definitely recommend the Oasis and its crew. Aaron and Jim were wicked guides and the chef was awesome, deck hands were cool too.Thanks heaps for hooking us up with a good trip. Thanks again. The Oasis was a good trip. We got some good waves most days and even caught some decent fish, which was great being able to eat fresh fish. If we were to go back again to the Mentawais I think we would find it hard to go with anyone else. For value for money, the size/space of the boat and Aaron the surf guide all add up to a good trip. This was an incredible trip on Oasis. 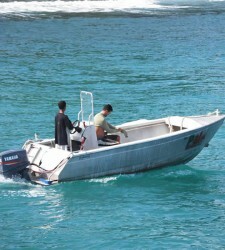 We had great waves and the guide genuinely asked and listened to the guys on the boat about what we were looking for. First boat trip, first time in Indo. I’m not a pro. I wanted solid waves but only chest to a couple feet overhead. I was stoked every day, surfing a couple times a day for 10 days. Pictures of a lifetime with a pro photog on board. In case there’s other folks looking for that, I recommend going with Oasis. They’re not ego maniacs trying to push everyone over shallow reef…they kept a good balance of keeping everyone happy. Food was amazing and boat was spacious and comfy. Hard to imagine it being better. Very grateful to Daniel and the crew – I’ll be back. We had a fantastic trip, Man the waves were so consistent and the winds settled down after the first view days. There were No crowds I mean we surf most breaks with only our boat, which has not happen on any other trip before. 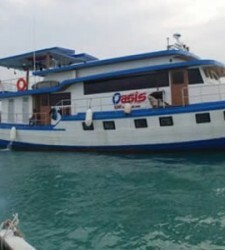 Oasis is in good working order and properly up there with one of the most comfortable boats I have been on. Crew were good and willing to help at all times.